The Pretzel had classic, stock factory cars painted a fire engine red with golden counterweight pretzels made of cast iron on the sides. Who doesn’t remember the anticipation as the empty car slowly approached you to board, seating yourself on the sweaty upholstered seat and the dread of crashing through the set of black double doors to enter total darkness. The slat floor ride had original black-boxed Pretzel stunts, many supplied by Animated Display Creators of Miami. I recall very few of these stunts, though I did manage to capture a mummy skeleton once during a lights-on ride with my Kodak Brownie Instamatic. There were also heads of a pop-up devil, witch and gator, flashing lights, blaring horns and occasional black threads hanging from the ceiling that swiped over passengers’ faces. Throughout the ride was the classic sound of the grinding and clicking of the car’s periodic electric pickup on the single, twisting rail track. One year on the way to the beaches of Wildwood, New Jersey, for summer vacation, my family stopped at a gasoline station in Bridgeton. By coincidence and surprise the Pretzel Ride Company was located just behind the station! The gas attendant kindly arranged an impromptu tour of the factory. I remember I was somewhat disappointed as the cars were being tested on a rail in broad daylight (as I imagined they were meant to operate only in darkness!) This was the dawn of the double-decker dark ride era, and the cars were running up slightly graded inclines at various points along the test track. Still it was an exhilarating experience to see where the original dark ride was manufactured and something to brag to my school classmates in the fall. Before television advertising--and decades before the internet--news of next season’s rides or renovations at amusement parks did not exist. 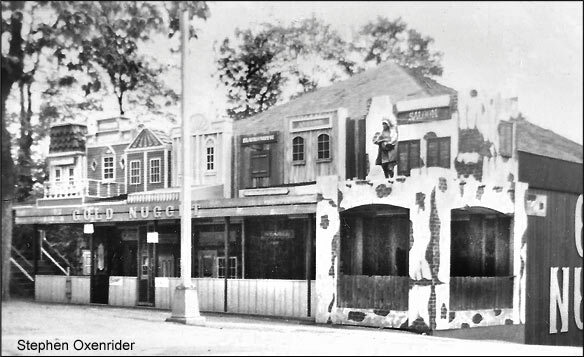 So it was a total surprise to return to Hershey Park spring of 1964 to discover the beloved Pretzel had been renovated by Bill Tracy and his Outdoor Dimensional Display Company into the Gold Nugget, a western theme dark ride complete with a stuccoed Old West town storefront facade. The ride cars now took on the appearance of miniature mine trains. The track had been reconfigured and about halfway through the ride, vehicles would emerge briefly onto an outdoor deck balcony in the back of the building, make a few twists and turns, then return to the darkness. The ride had also taken on a whole new aura with the introduction of black light.